Matching Dragoons: Jonah Hex #87 "Resurrections"
We have cheesecake, yes we do. We have cheesecake, HOW 'BOUT YOU?!?!? Well, if you have a copy of Jonah Hex #87, you have enough cheesecake to open a factory and name it thusly. Our timely tale opens with Jonah Hex packing his bags while Adrian is lounging in an 'easy on the eyes' nighty in an obvious attempt to have Megan Fox portray her in the upcoming film. Adrian wants to know why Jonah is suddenly leaving and Jonah finally fesses up that he doesn't want to be a lap dog to some high society debutante. Jonah does offer to take her along with him, back to the wild west, but Adrian is hesitant to leave her family and Jonah walks out with a slam of the door. Meanwhile (and there will be a lot of that word being used this issue), Brett is reading in the Orleans Daily (even though they are 100's of miles to the west) about the bank robbery that was almost ruined by Emmy Lou. They get into an argument with Brett reminding Emmy that he alone is responsible for her safety and then grabs her and starts with the smoochy-smoochy. And of course, that is the moment the other two women in Brett's gang return with supplies. AWKWARD!!! Several days later Jonah has hitched a ride in the locomotive of a westbound train. The engineer is slowing down to let Jonah off but then he sees something on the tracks ahead. Of course, it is several sticks of dynamite that blows the train to Hell & halfway back. Four hardcases swoop down on the wreckage and start looting the train. Jonah, battered & bruised, manages to pull himself out of the twisted steel but manages to get spotted by the looters. He ducks and runs off into a nearby swamp. Meanwhile, in the town robbed last issue, the sheriff returns with his posse, having not found hide nor hair of Brett and the girls. 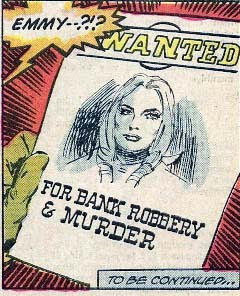 However, the banker's daughter has drawn up a fantastic likeness of Emmy Lou for the wanted posters. Back at the swamp, the four corpses-to-be's are still tracking down Jonah. Sadly, slogging through the swamp has jammed Jonah's pistols with mud, so he has to rely on his wits to get out of this mess. He grabs his knife, some scrawny trees and gets to work. Meanwhile, back in the swamp, one fool steps into a loop of vines, causing a branch to swing loose and slam him into a tree with a knife tied to it at heart level. His death spooks two of the survivors but the boss isn't deterred. It is obvious that Hex's guns aren't working and his knife is gone. Just then one of the goons spots Hex, takes a couple of potshots and then gives chase. Sadly, he steps onto a covered pit and quickly lands on the bottom of the spike-filled pit. Back at Brett's hideout, the two girls want to have a word with old Brett. He tells Emmy to hold tight and Brett and the girls take it outside. They think that Brett is showing too much attention to Emmy and he starts laughung that they are jealous. Of course, he starts handing out hugs and kisses and everything looks like it's gonna be alright for Brett and the girls. Night has fallen on the swamp and the two survivors have built a fire, planning their next move. Just then Jonah leaps down from a tree above them, kicking the loving crap outta both of them. The boss grabs his rifle and Jonah grabs the other goon as shield. The boss fires anyway and Jonah jumps the boss and pummels him senseless. Just outside New Orleans in a doctor's office, The Gray Ghost lays on his deathbed. His son, Jeremy, comes in and the Ghost hands over the uniform of the Ghost and has Jeremy swear a solemn oath to continue the work of the Gray Ghost. Jeremy does this and the Ghost, dare I say it, actually gives up the ghost. 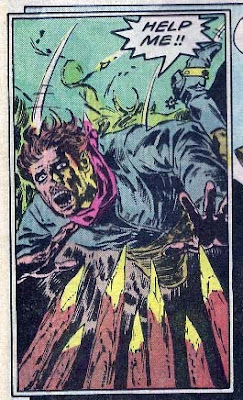 Jeremy, swears that he will avenge his father's death by killing Jonah Hex! Timeline - This one covers two days from last issue. No telling how much time elapsed between issues. I would say we are still in July 1878. Not a bad issue. Jonah's killing of bad guys isn't advancing the plot here, just adding action. The plot now is mostly Jonah coping with Adrian and Emmy coping with Brett. We have seen no sign of Turnbull, Mei Ling, or JD Hart for some time now, but they will be returning. It's hard to review these issues as standalones, because they are chapters in a sweeping saga that will pretty much continue until issue 92 when things take a dramatic change. I'll be posting more scans of this issue later, just wanted to get some color/flavor in there for now. Next Issue: Copycat crimes, a bloody train robbery and the death of Jonah Hex!!! Cheesecake inDEED! Still, it's a fun issue. Swampy death traps are always good!